Brookside Cottage in Beeley, near Chatsworth sleeps 6 people. 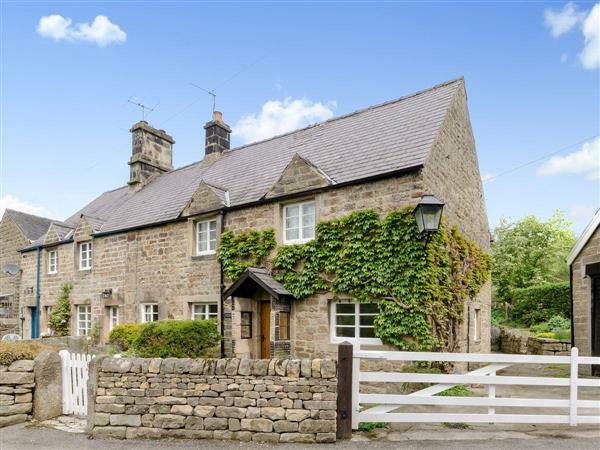 Semi-detached 17th-century cottage set in the quiet village of Beeley nestles in the Peak District National Park, close to the town of Bakewell and Chatsworth House and Park. The beautiful countryside offers excellent walks. A super holiday home, with exposed beams, stonework and deep recessed windows. To the rear there is a rock garden with a gravel area for sitting out. Shop and pub 100 yards. Ground floor: Living room with double sofa bed (for alternative sleeping) and beams. Dining room with beams. Kitchen. Utility room. Bathroom with shower over bath and toilet. First floor: 3 bedrooms: 1 double, 2 twin. Shower room. Separate toilet. Open fire in living room (no fuel provided). Gas central heating, gas, electric, bed linen and towels included. Cot. High-chair. Video. DVD. Stereo/CD. Gas cooker. Microwave. Washing machine. Tumble dryer. Dish washer. Fridge/Freezer. Tel-incoming calls only. Garage (1 car). Parking (1 car). No smoking please. Holidays run from Friday to Friday. NB: Steep drop in back garden. For a better idea of where Brookside Cottage is, you can see Brookside Cottage on the map below. Brookside Cottage is in Derbyshire; should you be on the lookout for a special offer, you can find all the special offers in Derbyshire. It's always worth checking to see what is on offer at the moment. Do you want to holiday near Brookside Cottage (1118), you can see other cottages within 25 miles of Brookside Cottage; have a look to find your perfect holiday location.